Michael Haxeltine Waverley dowsers chairman gave a short talk on dowsing to the Sandhurst Womans Institute and this article is an outline of the topics he gave to his amazed audience. He spent a few minutes talking about the history of dowsing both the provable as well as some conjecture and showed the audience one of his strange looking pendulums. He said the original had been found in an Egyptian tomb dating back 5000 years, which implies that the Egyptians practiced the art and science of dowsing. 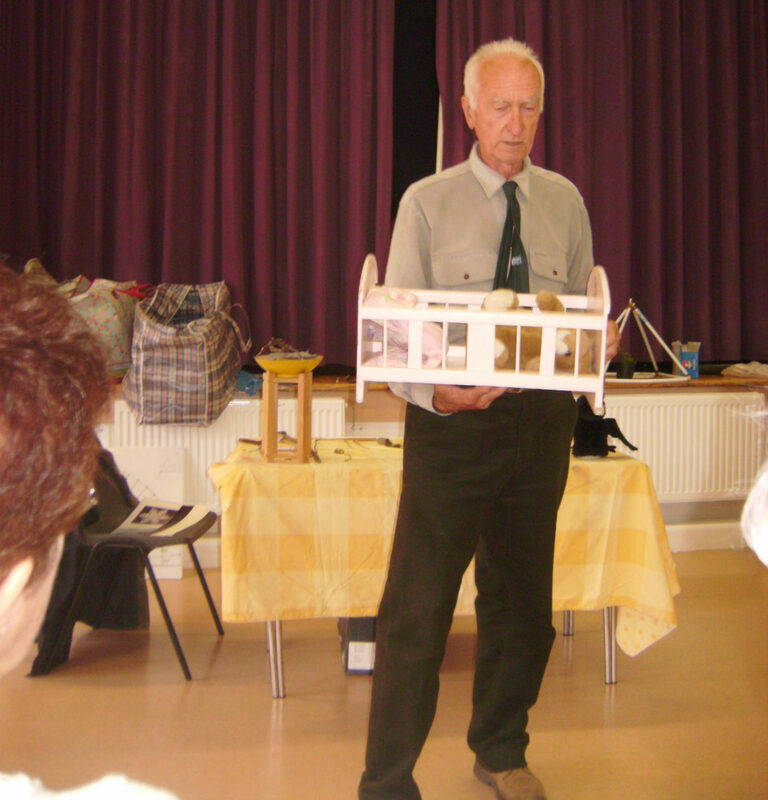 Michael went on to provide a talk on the theories of dowsing and that there are many views as to how it works, Mike also showed how you can dowse through plastic, water and lead. He explained to his amazed audience that nature had a few tricks and he placed a small branch from a Rowan tree on top of an object that he had been dowsing with his pendulum and this completely blocked the ability of his dowsing, of course the Rowan tree has another ancient common name, ‘The Witch’s tree’ this helped to demonstrate that the natural world creates its own energies and still has mystery’s that are difficult to understand. Everyone had a go at dowsing both with dowsing rods and a pendulum. One group of the audience had to find a fluffy t i g er whilst another group had to find a lost nail file which all helped to keep the demonstration and exercise’s light as well as producing some laughter. One volunteer had a very successful go at using a dowsing rod to find a number of old injuries on Michael from his parachuting days and all had a go at finding north with their dowsing rods which is a fascinating exercise. Michael is showing the ladies how geopathic stress (think of FengShui) could show in a baby sleeping in a corner of its cot. Geopathic stress rises from the ground and can affect the health of some people. 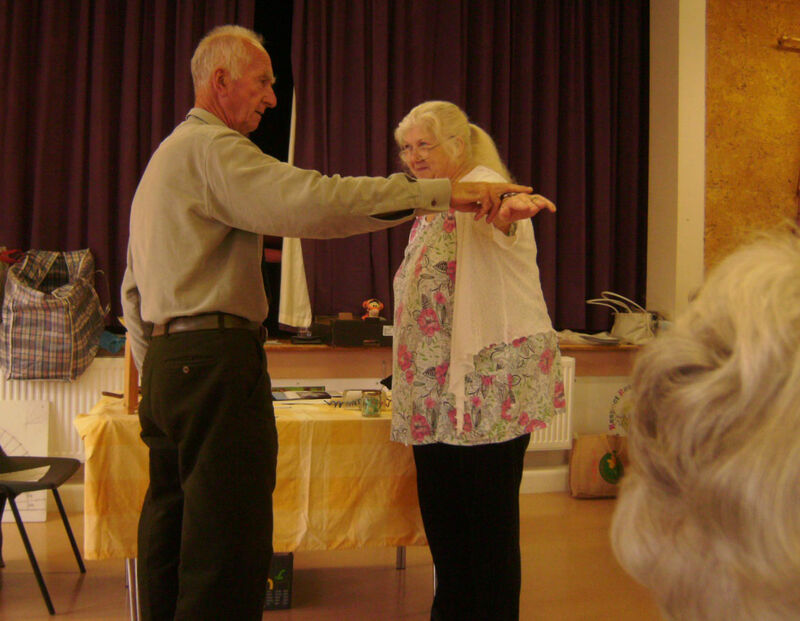 Michael dowsed an energy line running through the location of the talk and he asked for a volunteer to see if would affect them, the photo shows the volunteer is being tested with the arm muscles test to see if she is susceptible to this ground energy, however some of the ladies thought this was a bit to ”technical” to grasp. Michael also showed his audience how the energy of their minds could be measured when positive thought was concentrated. The audience enjoyed his talk and were surprised by the extent that dowsing could be used as a tool for study and investigation in the home, Oh! Yes they even though his jokes were funny. Michael is also an author of three books on Dowsing he is also available to provide talks on the subject, to purchase Michael’s books please contact Michael through the website contact form.